The Chartreux is a breed of domestic cat from France and is recognised by a number of registries around the world. It is not recognised by the GCCF in the UK as it is too similar to the British Blue Shorthair. 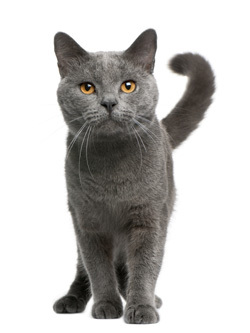 The Chartreux is large and muscular, with relatively short, fine-boned limbs, and very fast reflexes. They are known for their blue (grey) water-resistant short hair double-coats which are often slightly nappy in texture (often showing "breaks" like a sheepskin) and orange- or copper-coloured eyes. Chartreux cats are also known for their "smile"; due to the structure of their heads and their tapered muzzle, they often appear to be smiling. Chartreux are exceptional hunters and were highly prized by farmers. The first letter of the official name of a Chartreux cat encodes the year of its birth; all Chartreux born in the same year have official names beginning with the same letter. The code letters rotate through the alphabet each year, omitting the letters K, Q, W, X, Y, and Z. For example, a Chartreux born in 2002 would have an official name starting with the letter T.